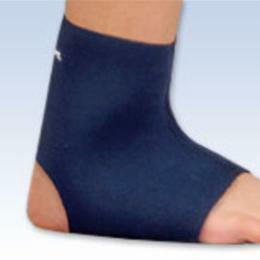 Sports neoprene for compression and therapeutic warmth Supports the ankle Limits swelling and decreases pain Allows for a full range of motion Easy slip-on style, open heel Can be worn over or under a sockIndicated for Mild Sprains, Ankle Strains, Tendinitis, Juvenile Arthritis, and Weak Ankles. Color: Navy.HCPCS Code: A9270 Series Sizes Approx. Age Fits 40-701 PED/LG 6-7 yrs 6 1/2 - 7 1/2" 40-701 YOUTH 8-12 yrs 7 1/2 - 8 1/2" Regular Line 40-701 SMALL 13+ yrs 8 - 9 1/2" For correct sizing, measure around ankle.